Now that you have Slack application credentials, you can integrate the application with your Amazon Lex bot. To associate the Slack application with your bot, add a bot channel association in Amazon Lex. 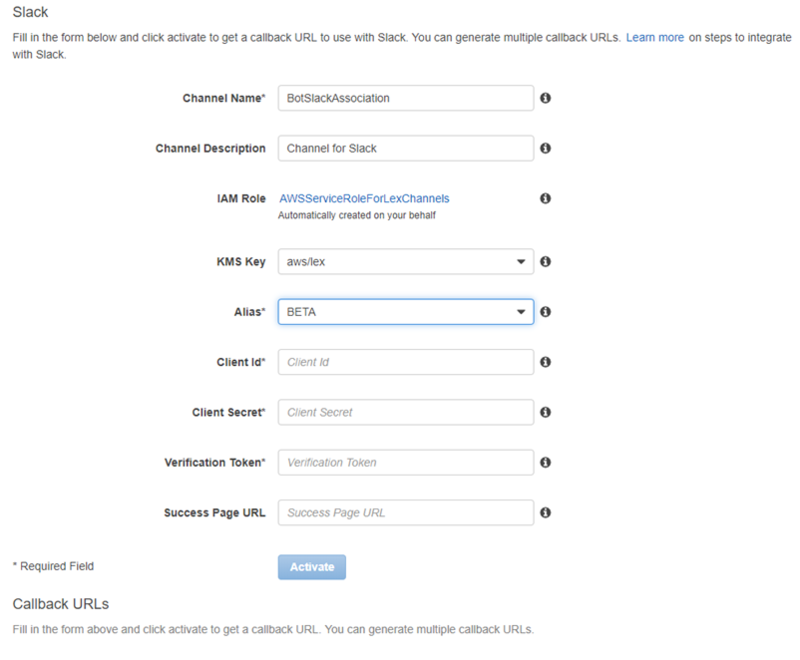 In the Amazon Lex console, activate a bot channel association to associate the bot with your Slack application. When the bot channel association is activated, Amazon Lex returns two URLs (Postback URL and OAuth URL). Record these URLs because you need them later. Choose the Amazon Lex bot that you created in Step 1. In the left menu, choose Slack. Type a name. For example, BotSlackIntegration. Choose "aws/lex" from the KMS key drop-down. For Alias, choose the bot alias. Type the Client Id, Client secret, and Verification Token, which you recorded in the preceding step. These are the credentials of the Slack application. As the request URL in the Event Subscriptions feature of the Slack application. To replace the placeholder value for the request URL in the Interactive Messages feature of the Slack application. The OAuth URL is your Amazon Lex bot's endpoint for an OAuth handshake with Slack.